the fighters are lone wolves. I too am a wolf. “Fire 1” you shout, but you lack the enthusiasm you had the first time you captained the ship. “Ready another torpedo… get those targeting sensors back online.” The words come out nonchalantly. You’ve done it all before, seen it all. Is there no more joy to be had in exterminating your vile and pathetic enemies? Well, you greenhorns, it’s time to get back on your feet and buckle up. Scientists have come up with some experimental technology to enhance the armaments of your ship, and your docking bay is loaded with a fresh new set of fighters to bring a whole new level of pain. Your world has expanded and now it’s not just a Dice Duel. It’s a Dice Duel: Die Fighter. 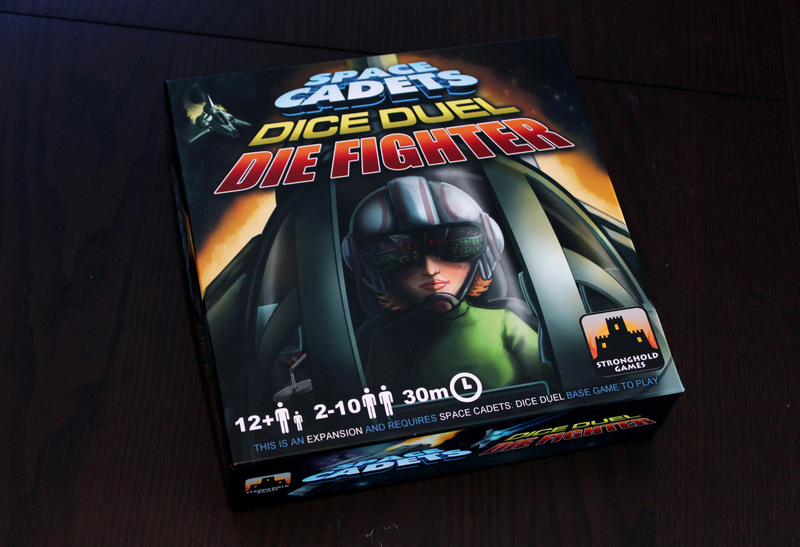 Space Cadets: Dice Duel: Die Fighter (henceforth referred to as “Die Fighter”) is an expansion to the real-time dice-rolling team combat game, Space Cadets: Dice Duel. 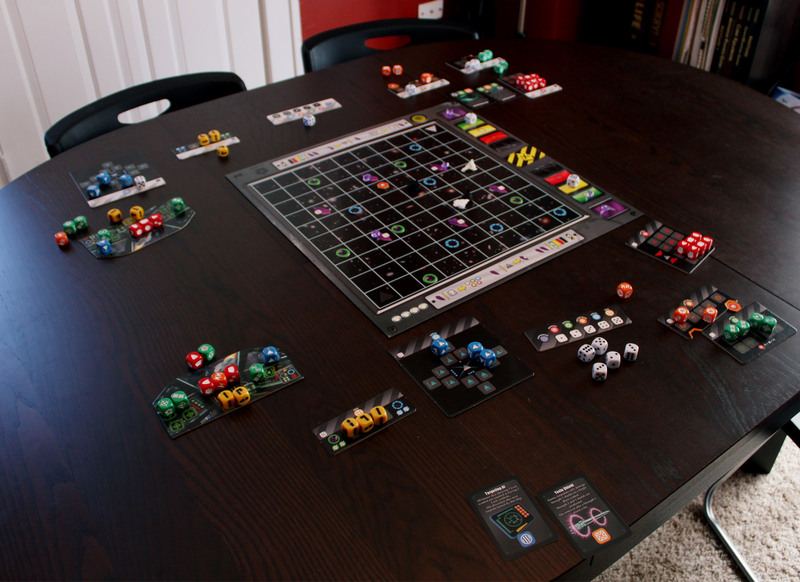 If you’re unfamiliar with the base game, please check out our review here. Now that you’re back, what does Die Fighter add to the mix? Two things. First, it adds the titular Die Fighters. Each team now has access to an additional ship that is piloted by a single person. The Fighter has smaller and more limited systems than the Capital ship; it has no tractor beams or shields, and can only fire its single torpedo in the forward direction. It also requires no energy dice – the pilot can simply roll all the system dice they wish at any time – and it is faster and more maneuverable, requiring only two navigation dice to be locked in before it can move. The Die Fighter also has access to a special new weapon called the “pulse bomb” – instead of loading a missile, the pilot can replace the middle component of the torpedo with a lightning bolt from an orange die. The pulse bomb requires no targeting sensors and bypasses shields entirely, with a chance of scoring up to a devastating 2 hits on a capital ship. However, the pulse bomb must be dropped at point blank range. If a fighter is destroyed, the pilot is immediately beamed back aboard the capital ship, at which point systems can be reassigned as needed. A fighter can be launched again by spending 3 crystals. With the Die Fighter, 3 additional modes of play become available; the straight up team vs team game where each capital ship has a support fighter, the asymmetrical 2 fighters vs. 1 capital ship team, and finally the new 2-player fighter vs fighter. But the expansion doesn’t stop there; the second addition to the game is a deck of “Experimental Equipment” upgrades. At the start of the game teams take turns drafting two technology cards from a limited pool (you won’t see every card every game). The equipment cards add new and exciting abilities. They might modify weapons (more powerful torpedoes, the ability to load 3 torpedoes instead of 2), enhance movement capabilities (move faster, rotate without moving, warp control), or allow other unique rule-breaking abilities. Many of these cards require dice from multiple systems, so you can load that extra-powerful torpedo but it’s going to use one of your shield dice. These cards also make use of the mysterious extra symbols on some of the dice. The normal gameplay and victory conditions still apply; first to wipe out the other team’s capital ship is the winner. Doomsday Weapon or Crash Landing? It’s a good thing we have already established previously that Dice Duel is a great game that you should love, so I don’t have to urge you to give itanother shot with the expansion and all of the things that it fixes. The fact is there was nothing really to fix. Die Fighter just adds more cool stuff. To that end, Die Fighter is a good expansion and well worth picking up if you enjoy the base game (which you do). That being said, there are things I love about it and there are things I’m not as thrilled about. The first thing I love; the tech cards. 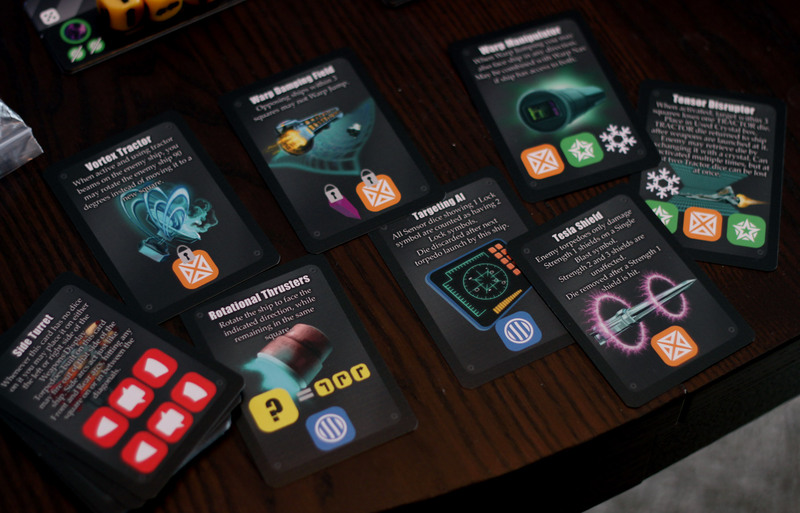 I’ve always been an outspoken fan of asymmetrical powers in board games, and the new options add just that into the game. These cards add more strategic options involving risk versus reward. Sure, you can load 3 mini-torpedoes instead of 2 normal ones, but those torpedoes aren’t as effective so you have to make sure you attack an unshielded side of your enemy. The ability to choose where you Crystal Warp is great, but you’ll need to spend a lot of time collecting crystals and as long as that power is active you’ll be short one die elsewhere. With the basic foundation of the game down, it’s not much of a stretch to use these tech cards. Mechanically they work the same way as any other systems – you’ve got to lock in the appropriate dice with the appropriate symbols showing. If you need a weapon die, the engineer passes power to the weapons systems. If you need an orange die, transfer power to the tractor beam. Really, only the captain needs to worry about how the tech card works, and as other players get more experience with the game they’ll quickly pick it up. That being said, it does add an extra element for players to be aware of, so you might want to leave them out if you have more than a couple newbies. I would also recommend using these only with higher player counts. Are these cards imbalanced? There’s always that chance. Often imbalances don’t become apparent until dozens of plays and months of experience. That said, none of the powers granted by tech cards seem particularly swingy; they’re incremental enough to keep in check, but powerful enough to be interesting and fun to use. While some cards may have more of a clear, direct benefit, you can arrange your strategy around any of the available cards to play more effectively. It’s still strong team play that carries the weight here, and theoretically a coordinated team without any tech upgrades could beat an upgraded ship by using smart, tactical play. You can see your opponent’s powers anyways, which means you can take steps to defend or counter them. Technology cards are only one part of the new mix, though. The bigger addition is the fighter. The 1v1 game is all right, but if that was the only thing added to the game the expansion wouldn’t be worth a purchase. It works okay and in some ways it’s a good teaching tool – you can help a new player understand the concept of the game before jumping into a full battle. 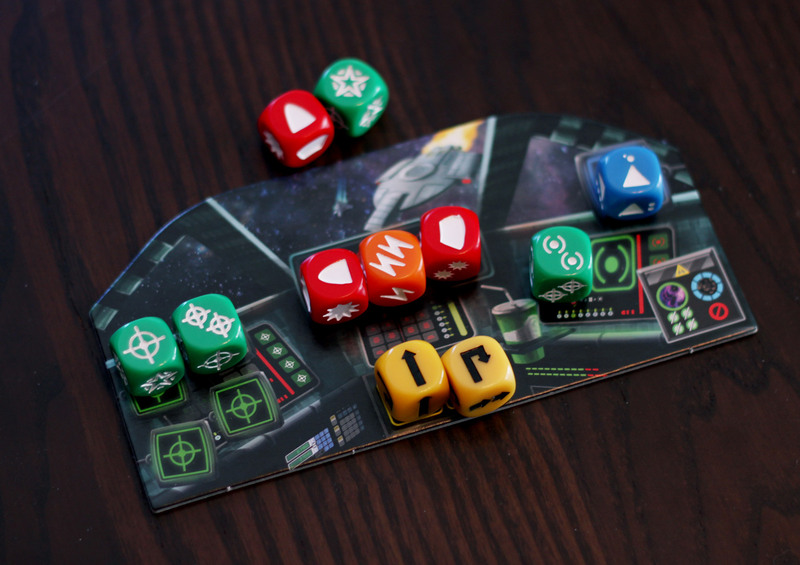 Despite having to manage multiple systems at once, the fighter’s systems are simplified and do not require mixing with engineering dice. The downside is that you really lose out on the most enthralling part of the game – the team play. 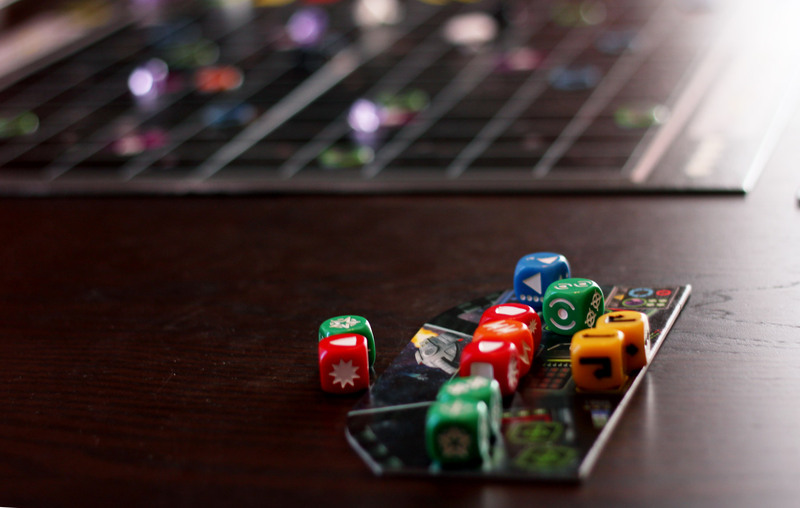 I always prefer playing Dice Duels with more people, because it’s more fun to work together. Without a team, and with only a few simple systems to work with, there’s not as much fun factor, and certainly a lot less strategy. You can’t pick up crystals and defenses are very limited, placing the focus on the speed of dice-rolling over coming up with any sort of plan. I guess this is somewhat thematic, since fighter control tends to be more reactionary and based on immediacy. It’s just not as fun, I think, as the team play. Where the new fighters really shine is in the full game, 5 on 5. 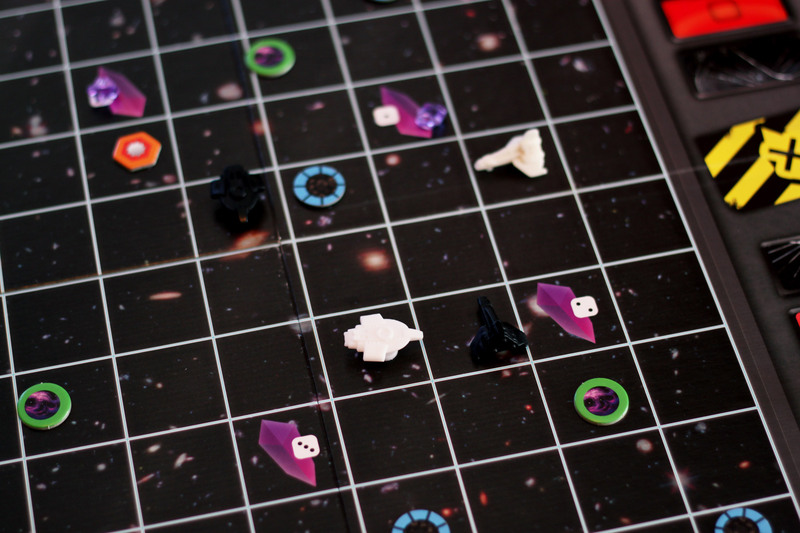 It adds a new layer of chaos and strategy – now the captain can not only coordinate the different systems on her ship, but come up with an attack plan coordinating with the fighter as well. With a bit of luck, a well-coordinated attack plan could take an enemy capital ship out in a single pass. Which brings up the main caveat; the Die Fighters are quite the wild card. Mechanically, they’re not difficult to incorporate if you understand how all the systems work. Strategically, fighters carry a lot of firepower if you’re not used to dealing with them. They move faster and a pulse bomb attack can be devastating. 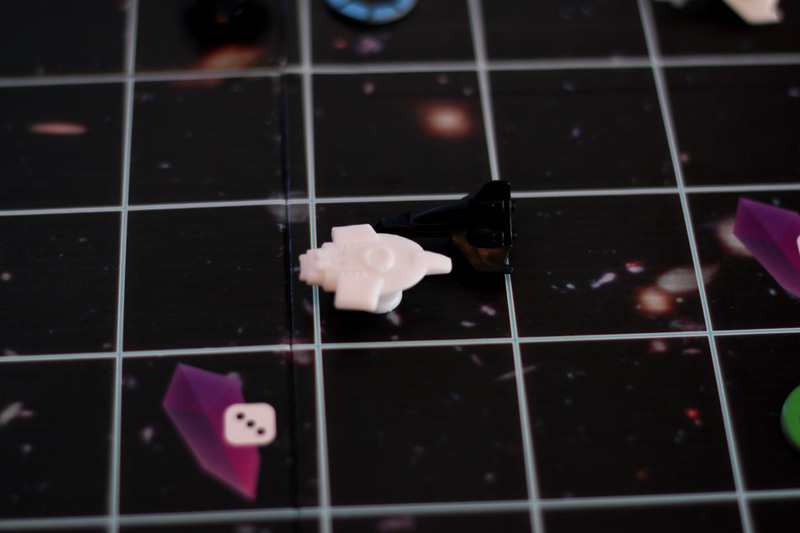 In early games using fighters, it’s very easy for the fighters to simply charge and attack the capital ship. This makes it extremely important for Capital ships to stay on their toes, and essentially puts them on the run from the fighters. It would seem to be wiser in the long run to keep your fighter close to your capital ship to defend against the enemy fighter and attempt to wipe it out quickly. When that happens, the team that sends out their fighter alone will likely lose their fighter quickly and then become quickly outgunned, so that both teams must keep their fighter back, helping return the game to a steadier pace. In the meantime, the game rules actually recommend that when you first introduce die fighters to your game, you give them fewer hit points to work with. I enjoy the tactical aspect of having the fighters on the board and certainly the allowance for more players, but in some ways I don’t enjoy the fighter addition as much as the rest of the game. Even though the ship and fighter can coordinate their movements, the fighter pilot basically acts as a lone wolf, doing what they want separate from the rest of the crew. It does take a little bit away from the team play element that I love so much about the base game. It’s not enough that I wouldn’t still happily include the fighters in the game, but it is enough that I wouldn’t always default to using them. I think the fighter’s best use is with a room full of experienced players who really enjoy the game. Some players – those who will play the game and enjoy it, but from a more casual standpoint – will probably not like the extra chaos or layer of tactics added by the fighter. Is this expansion worth a purchase? Definitely. The tech cards are a great element that can mix up your play to extend the life of the game. The fighters are enjoyable and certainly add new levels of the game to explore. While it may not be essential, Die Fighter adds plenty of content to play with in the wonderful Dice Duels universe, and I highly recommend checking it out. Random final thought: I never tried this but you could concievably combine 2 copies of Die Fighter for a 2vs2 fighter match. You could play to elimination or come up with some alternative goal, but that could be an interesting way to reduce it down to just the fighters. I dunno. Random.